If 720p just wasn’t enough, 1080p is now here too. Can you imagine all the TV one-man-bands in the near future? No need to get your constantly outdated equipment out, just film a press conference on the iPad, edit it with iMovie or Avid Express for £2.99 and upload it to YouTube. Welcome, Citizen Reporter – your quality is now better than CNN and APTN. It has built in video stabilisation too – so if you’ve had too much coffee your shots will still look excellent. It appears the focal length has changed on the new iPad camera – don’t ask me what it is, it’s not really relevant because we don’t know how big the sensor is anyway. What is relevant is the captured viewing angle. It’s not much, but we gained a bit of room with the new iPad. Great! Would it be the same for video I wonder, where we really really need wider lenses to cope with close environments? Let’s take a look at it now. I’ve switched both iPads into video mode and pointed them at the same scene again. Yikes – it’s the other way round. And it’s off by about 50% – that’s a shame. 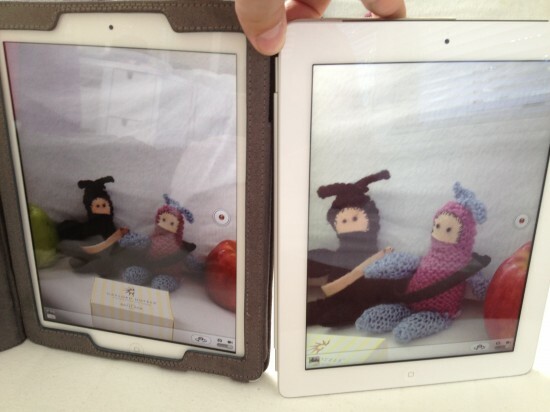 I always disliked video cameras that were too close, and the new iPad just got closer. 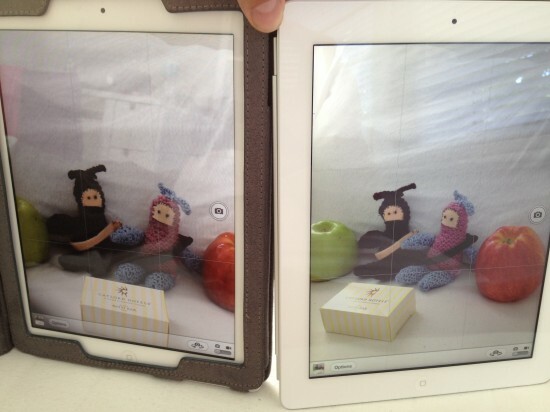 Video is – compared to stills – more zoomed in on both devices, we knew about this already. It’s because not all pixels of the sensor are used to capture video, they literally just to a centre cut-out to match whatever standard you’re shooting. I bet the aforementioned video stabilisation is the culprit: a common technology in video cameras is to shoot more pixels than you need, then zoom in to a “safe action” and match what’s similar from frame to frame. That way you can shake your camera but it’s “buffered” by the extra surrounding pixels you shoot. It’s great to have that feature, I wonder if we should have a choice to use it or not. At first I thought it was my device, but when we tried it in Julia’s purple case of the exact same make it went to sleep just fine. Must be my cover then – beware of such disappointments. Now we’ll examine the 4G capabilities a bit closer. It gets techie, but bear with me here.